The fifth season of the American Grown Field to Vase Dinner Tour has just been announced, and we want you check out the destinations, grab all of your flower-loving friends and join us on a flower farm for an award-winning experience you’ll never forget. We couldn’t be more excited about the lineup of farms involved with this year’s floral-infused dinner tour. Known for stopping at America’s most beautiful flower farms, this year’s tour features amazing locations, including a peony farm in Alaska and a return visit to one of our most popular stops! So grab your calendar and check out these destinations! You ‘ll be surrounded by flowers with a view of the Pacific Ocean during our dinner at The Flower Fields of Carlsbad. Photo by Carrie McCluskey Photography. 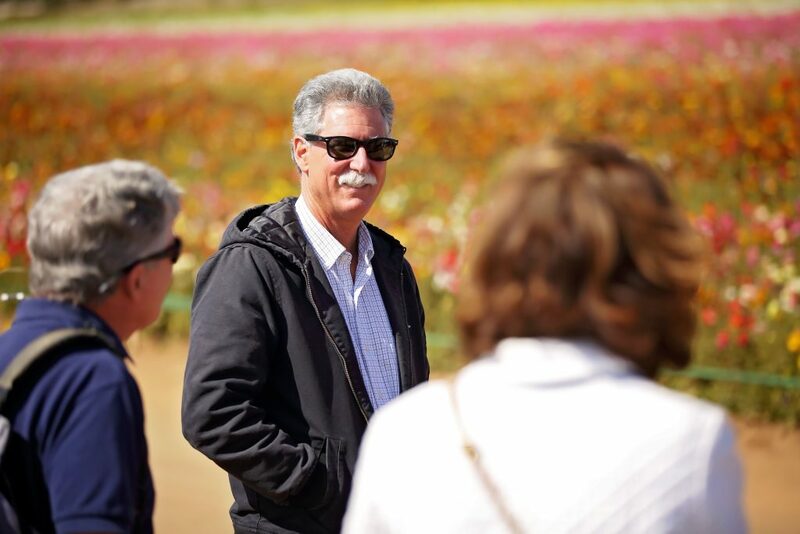 We’re thrilled to be starting the 2019 tour at The Flower Fields in Carlsbad, California, on April 18. The American Grown Field To Vase Dinner Tour returns to this postcard of an experience each year. Guests at this dinner get exclusive access and enjoy dining among acres and acres of colorful ranunculus while looking out over the Pacific Ocean. This is a very popular tour stop that sells out faster and faster each year. Click here to save your seats The Flower Fields! We want to see your name on the guest list during this year’s tour. Photo by Carrie McCluskey Photography. Next, we’ll head to Bloomia USA in King George, Virginia, on June 1, where guests will dine in a greenhouse bursting with tulips and hear about the flower-growing process for these flowers that so many name as their favorite bloom. Click here to save your seat to Bloomia! Grab your friends and find yourself at one of our tables during this year’s tour. Photo by Eye Connoisseur Photography. On June 12, the tour heads back to California for a unique stop smack dab in the middle of a city This pop-up dinner destination will not only “pop up” a meal experience on the lawn of California’s State Capitol, we’ll be popping up a flower farm experience in the shadow of the Capitol building! We’ll be working with our farms to bring our American Grown Flowers story to the steps of California’s Capitol building, sharing our collective stories, the flowers we grow and the value our American flower farms bring to their communities and the economy. This dinner will bring flower farmers together with lawmakers to highlight just how important the consumer movement toward American Grown Flowers really is. Click here to save your seats at the Capitol. Picture you and that special someone on that Alaskan floral adventure you’ve been dreaming about. Photo by Joshua Veldstra Photography. On Aug. 3, we head to Alaska! We couldn’t be more excited to return to Homer, this time for a stop at Joselyn Peonies, where guests will dine in a field of blooming peonies on a farm with views of Kachemak Bay. This destination also includes additional excursions such as fishing trips and a multi-farm tour. Be sure to check out all the reasons you should join us in Alaska and turn it into a true adventure! Click here to save your seat at Josyln Peony Farm! We can’t wait to dine in the middle of the stock fields of Ocean View Flowers! Photo courtesy of Ocean View Flowers. In the fall, join us in Lompoc, California, at Ocean View Flowers on Sept. 7 where you’ll enjoy an artisan meal in fields of stock in a variety of hues. While there, you’ll learn about the unique coastal climate that helps Ocean View grow so many flower varieties on hundreds of acres. Click here to save your seat to Ocean View Flowers! You will find beautifully designed centerpieces by amazing floral designers at each one of our tour stops in 2019. Photo by Liraz Photography. Our last stop will be at Red Twig Farms in New Albany, Ohio, on Oct. 5, where you’ll dine under a canopy of dogwood and willow branches. You don’t want to miss out on a visit to this nine-acre family-owned-and-operated cut flower and branch farm in central Ohio that grows oh so many specialty flowers and branches. Click here to save your seat to Red Twig Farm! We’ll be focused on the flowers, but the food and wine will not disappoint. Photos by Kelleghan Production. There’s so much more we could share and explain, but for now, please visit the landing pages we’ve created for each one of these locations; find the complete list here. You’ll discover even more information and details about each stop, but make sure you book your tickets right away. Last year, we had dinners selling out months in advance! The Certified American Grown Field to Vase Dinner Tour has served over 5,000 people in the last four seasons. Photo by Kelleghan Production. Plus, early birds benefit from special “Tour Launch” pricing. For the first 30 days, we’ll be selling tickets to each of our dinners for $175, however the price for each ticket will increase after this introductory offer! Seating is limited and every dinner will sell out, so don’t wait to save your seat. Photo by Carrie McCluskey Photography. Please consider helping us share this year’s locations and special launch pricing with your flower-loving friends. If you’re planning to attend a dinner, invite them to join you. If you’ve gone before, help us share this magical experience with others on social networks like Instagram and Facebook. We can’t wait to welcome you to the flower farm. Photo by Liraz Photography. We look forward to seeing you on a flower farm in 2019! Farming and science have always gone hand in hand. But when two biology professors took a summer teaching gig in Alaska, the last thing they expected was to become flower farmers. Both professors at Miami University in Ohio, they’d spent their honeymoon in Alaska, and had always wanted to go back. So when Jill found out the University of Alaska Fairbanks needed professors to teach summer biology classes, she leapt at the opportunity. While there, they discovered that researchers at the university had been studying peonies for years. It turns out peonies in Alaska bloom at a time of year when they aren’t available anywhere else in the world. Over the past decade or so, as the state explored new agricultural possibilities to potentially replace the oil industry, these popular wedding flowers emerged as a promising crop. Amateur farmers began planting them experimentally—and one of them was the occupant of the office next door. The following year, upon returning to Fairbanks for the summer term, the Russells found out their office neighbor had presold her entire crop by February. She showed them her business plan and urged them to give it a try. As scientists do, they started researching. Within a year, they were ready to take the plunge. They bought an old hay farm on 40 acres and planted their first crop in 2013. Boreal Peonies, they decided, would serve a dual purpose as both a production and research facility. Of their 5,700 plants, they would devote 1,600 to science. Every day they measured the height of their plants and tracked their development. They experimented with soil chemistry in search of the perfect fertilizer. They shared their findings with the local farming community to help their adopted state grow its fledgling peony industry. Now in their ninth summer teaching in Alaska—and their fifth year growing peonies—the Russells have become permanent residents there, spending the school year teaching in Ohio before returning to Two Rivers for the growing season. With 16,000 production plants and 1,500 research plants, they anticipate harvesting some 40,000 stems this year. The farming bug has proven infectious. Two of their kids, both grown, and one of their graduate students also spend summers working on the farm—and they spend the rest of the year looking forward to it. Kelly Burger, graduate student, is spending her summer doing research in Alaska. Her work on boreal peonies focused on the effects of compost tea on peony growth. Add Unique Fishing Expeditions To Your Field to Vase Experience -- Space is Limited! Fishing is for everyone in Alaska. Among the great outdoor opportunities that tempt visitors to Alaska, fishing lands at the top of many bucket lists. It’s easy enough to see yourself pitted against nature’s ruggedness – and coming out the victor. This could be you! Imagine yourself reeling in a big King Salmon during your American Grown Field To Vase adventure in Alaska! This our dinner guest Val Mellano. She caught her king with Kenny on the Kenai River. Certainly, this dream has caught the attention of guests reserving their seats at the Field to Vase Dinner Tour in Homer, Alaska, at Joslyn Peonies on Aug. 3, 2019. And the professional fishermen in that area are happy to take the bait. Certified American Grown has reserved two special charters for dinner tour guests who are arriving early to revel in this state’s adventures. On Tuesday, July 30, join guide Kenny Bingaman and his team of expert fishing guides on one of their King Size Adventures to hook king salmon on the Kenai River. This 30-year veteran has a reputation for consistently producing fish for his clients during their eight-hour trips, some as large as 70 pounds. Don’t fret. Kenny will provide the right rods, reels and even clean your catch back at the dock. Seats are available for $300 per person, not including tip, and King Size Adventures will assign four persons per boat. Only 16 seats are available, so reserve you spot quickly! Reel in the catch of your life with North Country Charters while in Alaska for our American Grown Field to Vase Dinner. On Thursday, August 1, North Country Charters invites you to board its 53-foot M/V Irish with her crew for eight fun hours of challenging halibut fishing. All of the fishing equipment, bait and filleting are provided, so all you need to do to cast off is bring warm clothing and your love for competitiveness. Lunch is available for $15, but you ‘re welcome to bring your own. The cost is $225 per person plus tax and $25 for a one-day fishing license available at the North Country Halibut Charters office or online at admin.adfg.state.ak.us/license. Don’t hesitate – only 16 seats are available! Certified American Grown Administrator Kasey Cronquist reels in a 45 lb king salmon during the week of the 2017 Field To Vase Dinner at Scenic Place Peonies. And after you reel in the big catch? You’re welcome to donate it to be specially prepared and served at the Field and Vase Dinner itself. On the dinner tour’s last stop in Alaska, Certified American Grown Administrator Kasey Cronquist did just that after catching a 45-pound salmon. Because if there’s one thing better than attending one of our crown jewel events, it’s having a hand in creating it! Chef Dave took Kasey’s king salmon and served it to our guests during the American Grown Field to Vase Dinner at Scenic Place Peonies in 2017. Photo by Joshua Veldstra Photography. But first, make sure you have a seat at the dinner table at Joslyn Peonies. You won’t want to miss this uniquely Alaskan Field to Vase Dinner on August 3. And fishing expeditions are a special offer for dinner guests only. Join us at Josyln Peonies, in Homer, Alaska, located on the Kenai Peninsula and you’ll enjoy this stunning view of Kachemak Bay with your Field to Vase Dinner. Help Make The Floriculture Survey A Success! 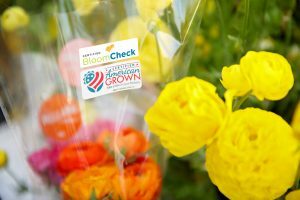 The national USDA survey of flower farms that provides the industry with vital information about production and trends, and gauges its economic impact, will be conducted again this year beginning in December. The survey was not conducted for the last two years due to budgetary constraints at USDA’s NASS program. Leaders from the California Cut Flower Commission (CCFC) and a team of farmers from Certified American Grown program flew to Washington, D.C., and met with USDA’s National Agricultural Statistics Service (NASS) Administrator Hubert Hammer [article link: http://www.americangrownflowers.org/americas-flower-farmers-must-continue-to-lobby-congress/] and members of the U.S. Senate earlier this year to encourage the administration and Congress to reinstate this important annual report. In February, Farmers met with USDA NASS Administrator Hubert Hammer about their decision to suspend the Annual Floriculture Report. Photo by Nony Pak of Ken Park Photography. Farmers met with Senator Diane Feinstein to discuss the need to reinstate the funding for the annual floriculture report. The Senator made it one of her top ag priorities in 2018. 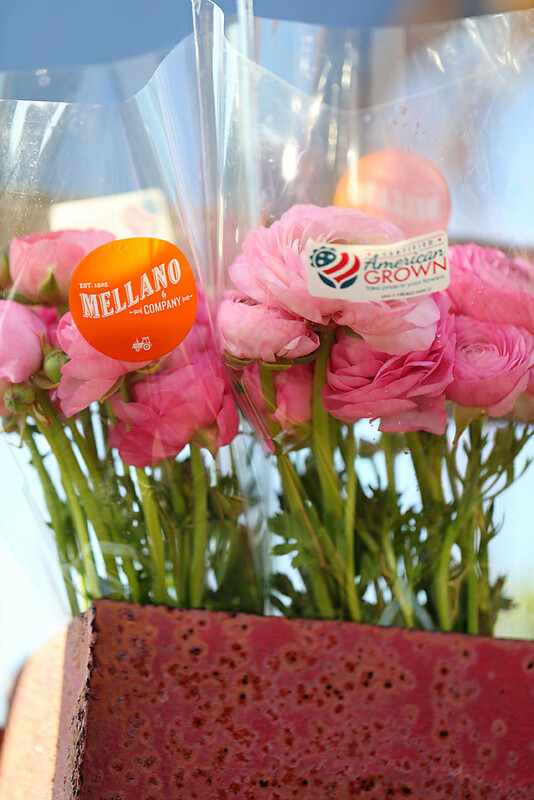 CCFC and Certified American Grown also worked in coalition with American Hort and the Society of American Florists to help raise the awareness of this issue on Capitol Hill. The survey is a census of about 10,000 commercial floriculture operations that annually produce and sell at least $10,000 worth of fresh cut flowers, potted flowering plants, foliage plants, annual bedding and garden plants, herbaceous perennials, cut cultivated florist greens, propagative floriculture material and unfinished plants. Annual sales include retail and wholesale sales. 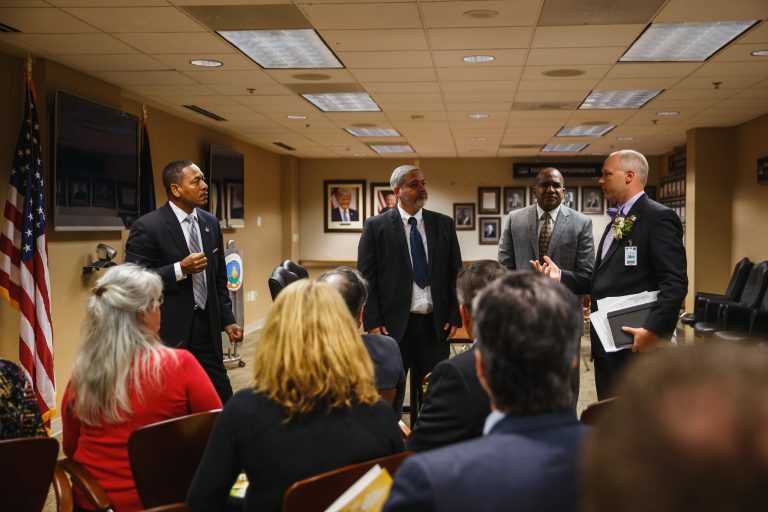 Last year’s delegation of Alaska’s flower farmers made a big impression on the team at USDA. So much so, Alaska’s flowers will now be counted as a part of the annual floriculture report. The survey provides the number of farmers, area of production, quantity sold, percent of sales at wholesale, wholesale prices, wholesale value of production for floriculture commodities and average number of agricultural workers per farm or ranch. USDA NASS Administrator Hubert Hammer speaking to America’s flower farmers during last year’s fly-in in February. The USDA first started collecting data on the nation’s floriculture industry in 1956. The report, called the Commercial Floriculture Survey, has grown to cover six floriculture categories in the 17 main flower-producing states and more than 50 separate crops. NASS says the survey provides an important snapshot of the industry and helps growers plan for the future. Certified farmers Benno Dobbe of Holland America Flowers in Washington State and Erin Caird of Glad-A-Way Gardens in California sporting their new USDA NASS hats following the meeting with NASS officials. Dobbe is the chair of the CCFC’s governmental affairs committee and a member of the Certified American Grown Council. Last year’s team of flower famers who were responsible for elevating the issue for reinstating the annual floriculture report directly to USDA NASS officials and worked with members of Congress to help secure the funding necessary for its reinstatement. NASS will collect data from growers by mail, phone, online and through personal interviews. 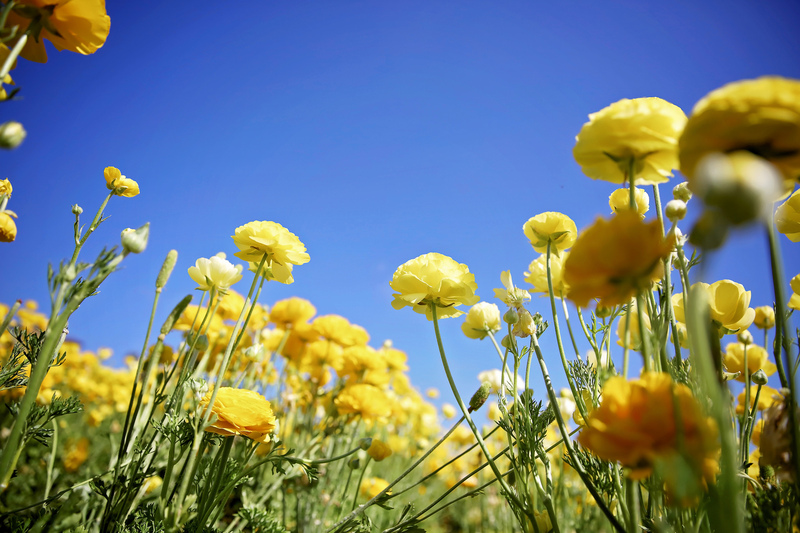 The Commercial Floriculture Survey will be mailed to farms on Dec. 14. Enumerators from NASS will be visiting farms and calling farmers to help complete the survey from Dec. 31 through Feb. 8. Consider joining your fellow flower farmers in Washington, D.C. in 2019. Join this powerful delegation of voices who are making a difference for America’s flower farmers. The reference period is the preceding year. The data will be published in the Floriculture Crops report on May 8, 2019. The information provided by growers will be used for statistical purposes only and no identifying details of respondents will be disclosed. In the last survey, which covered 2015, the nation’s total floriculture crop value was estimated at $4.37 billion, up from $4.20 billion for 2014. California was the leading producer with 685 operations producing crops valued at $1.08 billion, followed by Florida at $1.03 billion. Those two states accounted for 49 percent of the nation’s floriculture crop value. Rounding out the top five states were Michigan, North Carolina and Ohio. This Year’s Visit Is Critical! Year after year, we’re reminded of the importance of the face-to-face meetings we have during the annual flower farmer fly-in to Washington, D.C.
Our past efforts have netted the reinstatement of the national USDA survey of flower farms, inroads on bringing American Grown Flowers to the White House, expansion of the Cut Flower Caucus and strong relationships with policymakers. These things happen because we’re there. Flower farmers are seen and heard. They share their stories. They give policymakers a name and face to remember. It’s serious business. And it works. Which is why we’re asking flower farmers to join us February 26-28, 2019, for our upcoming fly-in. This is your opportunity to advocate for the work you do and its impact on the economy. It’s your chance to explain how policies from D.C. affect real farmers and their families. And it’s your opening to help make something big happen for flower farmers – like it did with the reinstatement of the farm survey. The Commercial Floriculture survey, arriving in your mailbox very soon, had not been conducted for the past two years due to budgetary constraints at USDA’s NASS program. But after leaders from Certified American Grown program flew to Washington, D.C., and met with USDA’s National Agricultural Statistics Service (NASS) Administrator Hubert Hammer and members of the U.S. Senate, the report was reinstated. We were heard. And there are other big issues we need to lend our collective voices to. Let us know you’d like to join the delegation by emailing Andrea Philpot at andrea@americangrownflowers.org. And be sure to participate in the Commercial Floriculture Survey, being mailed to farms on Dec. 14. NASS will be collecting data from growers by mail, phone, online and through personal interviews. Enumerators from NASS will be visiting farms and calling farmers to help complete the survey from Dec. 31 through Feb. 8. Your participation provides our farms and the larger industry with data that shows just how valuable our farms and flowers are to communities and to the economy. Just one more way to be heard.